I just thought I would do a quick post before I have to get ready to take Luke to preschool. He is eating his lunch - a tuna sandwich, my kids love tuna, go figure, and Amy is asleep. A cuppa just downed, oh goodness, I could go another one. Anyway, where was I before I started dreaming about a nice warm strong cup of tea on a raining and miserable day. I don't think rain is miserable really, I love the rain. I love the rain sounds, I love the rain feel, I love the renewing after rain. Rain is good. Really. Not miserable. So, this last week, what did I do? Hmmm. Nothing much. I didn't take Luke to preschool last week. Amy was sick and just because she doesn't have a voice or is able to express her opinion, I knew she was a tired grumpy bubby. So instead of dragging her out in the rain last week, we had a nice week at home. I enjoyed it. I found it relaxing not having to make the mad school run in the afternoon. I finished a layout for the Scraploot DT comp. I really wanted to keep this for my FK entry, but I really would like to be part of this DT team too. The colours are a bit off but there hasn't been much sun to speak of to get a good shot. If you clcik on it you will get a bigger pic. Amy had her first bubble bath. What is it with my kids and eating bubbles? LOL! They all do it! You'd be mistaken for thinking I don't feed them or something! And let me tell you, this one eats! She loves her solid food! The best part about feeding her is I know that another being in this family actually likes my cooking. Or she just doesn't know any better. Either way. 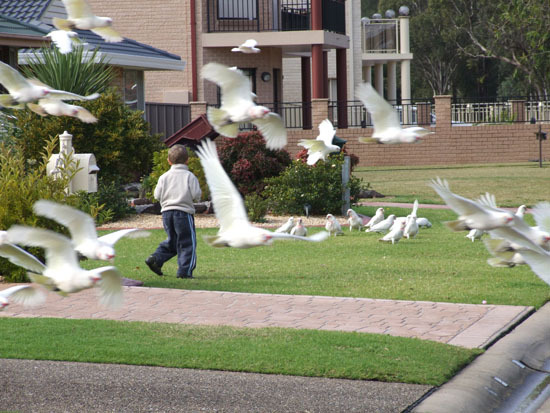 When we got home from our sewing class, the yard two houses up was covered in cockatoos! Of course Luke wanted to go and chase them and well, I wanted to too, but I refrained. Instead, I took some photos of him. Thats a beautiful layout Beth, I hope you make the team. I hope Amy is feeling better this week and Kate and Luke don't get sick. Was it the cold or something?